One of the advantages of Galaxy S5 is its expandable storage. You can use a micro SD card to expand the storage for your files. Galaxy S5 supports up to 128GB micro SD card. So, you can save a lot of photos and videos without worrying about the storage. By default, when Galaxy S5 detects a SD card, the new photos and videos will be saved to the SD card automatically instead of the phone internal storage (which is usually very limited) unless you change it. As mentioned, after inserting the SD card, the camera app will automatically save photos and videos to the SD card. In other words, by default, you don’t need to set it up. But sometimes, for whatever reasons, it may not work as expected. So, you may have to manually set the photo and video storage location to save photos to SD card. Step 3: Tap Storage location as shown below. Current storage location for photos and videos is indicated in the icon as well. Device refers to phone internal storage. Memory card refers to micro SD card. Step 4: Tap Memory card as shown above. If you want to switch back to the internal storage, you can choose Device. Step 5: Tap anywhere to return. Step 6: Take photos or record videos as usual. 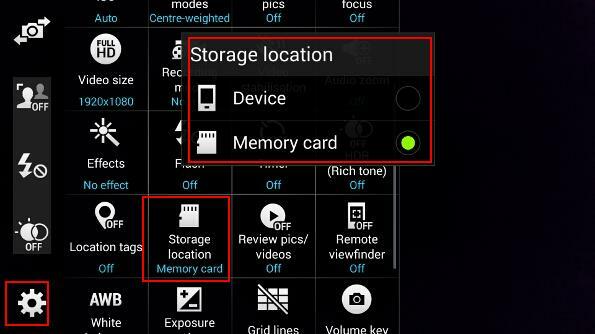 From now on, Galaxy S5 will save photos to the SD card unless you manually change the storage location. Why are my photos saved to phone storage, not the SD card? Sometimes, you may notice that Galaxy S5 saves photos to the internal storage, although you set the storage location as memory card (SD card). When Galaxy S5 burst mode is used, the photos taken with burst mode will be always saved into the internal storage, not the SD card. This is not a bug. It is designed in this way so that burst mode works well in you Galaxy S5. You cannot change this. Why my video quality is poor when saving to SD card? Not all SD cards are created equal. For micro SD and SD cards, there is a speed rating for them. For photos, most Class 6 is sufficient. Due to the small price difference, it is advised to get a class 10 micro SD card for your Galaxy S5. 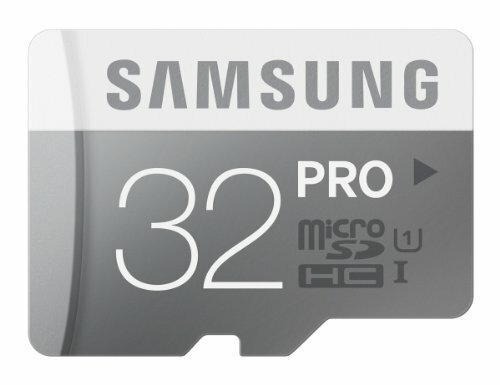 But for full HD videos, you need a Class 10 micro SD card, preferably with a speed of 20MB/s or higher. For example, you may try this Samsung Micro SD card. For UHD (4k) video, you need a Class 10 micro SD card with a speed of 45MB/s or higher. Otherwise, the video quality will be affected. To record UHD videos on Galaxy S5, you should get at least this SanDisk Extreme Micro SD card. Here are some micro SD cards you may consider for your Galaxy S5. Can you save photos to SD card on Galaxy S5? If you have any questions or encounter any problems to save photos to SD card on Galaxy S5 or set the storage location on Galaxy S5, please leave a comment in the comment box below. Recently, my pics will randomly show a gray box or band like going veritcally or horizontally across the pictures. Why is it doing this? Please help. I’ve had this phone only 2 months! First, try to clean the lens cover. You can try to clear cache and clear data for camera app in Settings–Application Manager –All–Camera. You can also try other camera apps, e.g. Google camera or Camera360 to see whether you get similar problem. If it is a hardware issue, you have to visit local service center. It should be covered under warranty in most regions. When I want to save a picture like from Facebook, it didn’t store it on sd card automatically, why? Because the app doesn’t support SD card. For such apps, you need to manually move the downloaded files to SD card. How do you do this manually then? I want to manually move my photo files (not just ones taken through the camera, and any files for that matter) from my internal storage to my SD card and I don’t see the options that were described above. You can use My Files app to move any files. I have a Samsung Galaxy S5 & whenever I download images from MMS messages is saves it to the phone instead of my SD card. I’ve searched and searched and found no way to change this. Help? Media files in MMS are always saved to internal storage. This is universal for all Android phones. Got cannot change this behavior as it’s hard-coded. Anyway, you can always move them to SD card manually. My samsung microSD Card has been wiped out totally. The phone doesn’t even recognize there’s a card present. Same thing when i insert into laptop. Is there any way to recover. There are pix and videos of my dad before he passed away and of my pets before they died. Please advise. It depends on how the data were wiped. Data recovery is always expensive and none can guarantee anything. You may check with local data recovery service providers. They can evaluate the case based on what you have. If you simply enabled backup in Photos app, you would never have encountered such an issue. Can you access camera settings? My camera options/settings dont include a “storage” how else can i get the camera to auto store to SD? Is the SD card detected in My Files app? Can you share a screenshot in our Facebook page? Can My Files app find the attached card? i have the same problem—i cannot find the storage location from the camera app, and i am able to locate and see what is on my sd card. when my sd card filled up, the phone defaulted to putting files on the internal storage and i cannot get it to go back to the sd card. cannot find anywhere that i can choose it, even if i force quit the app to “restore” it’s storage location. You can power off the phone, remove the SD card. Power it on. Wait a few mins, then power it off. Now put the SD card back, and power on the phone. thanks simon. tried that, nothing changed. i did an online chat with VZW and they suggested changing the sim card based on some other problems. that did not fix it either. i’m at a loss as to how to get this work like it use to just a few weeks ago. if you have any other thoughts, i’m open to them. When your insert micro SD card, do you get any notification? You can try to clear cache for the camera app. In settings – application manager, find camera app, then clear cache and clear data. This will reset the camera app. I still am using my Galaxy S5 in 2018…the storage icon is not longer available in the camera settings. Is there another way for me to manually set my phone so that pictures and videos get save to my SD Card? You can try to power off the phone, then power it on. You can also remove the SD card, then add it again. Normally, if My Files app can find the SD card, the camera app should be able to find it. Data get corrupted due to many reasons and but many people have no idea to recover it back again but here the procedure is very nicely explained in this article with proper screenshot.